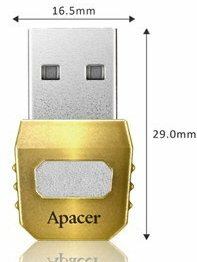 Apacer claims its new AH152 is world's smallest USB 3.0 flash drive, the product measures just 29mm x 16.5mm x 8mm and offers a water-proof, dust-proof, and shock-proof enclosure. Unfortunately, it's only available in 16GB and 32GB capacities, and the max speed of 80MB/s isn't too exciting either. Apacer has broken the technological limits and leads the world by rolling out the Super-Mini USB 3.0 Flash Drive, AH152. By using COB integrated technology, it establishes two invincible legends: the fastest mini flash drive, and the smallest USB 3.0 flash drive. Smaller than a coin, AH152 has a transmission speed of up to 80 MB/s and enhanced water-proof, dust-proof, and shock-proof functions. It's quite simply unsurpassable. AH152 is the world's first USB 3.0 Flash Drive featuring COB integrated technology. The super-mini 2.9 x 1.65 x 0.8 cm dimensions demonstrate Apacer's consummate R&D power. AH152 not only minimizes on size, but also offers water-proof, dust-proof and shock-proof functions. As the smallest USB 3.0 Flash Drive, AH152 features an explosive transmission speed reaching 80 MB/s, taking the crown among other mini USB products. The 16 GB and 32 GB bulk storage capacity allows full HD videos to be played easily and smoothly, and high capacity files can be transferred in seconds. In addition, AH152 is equipped with a plug-and-play function and is backward compatible with the USB 2.0 interface, making it the prime choice today when the USB standard is evolving into a new one! Compact IT products are the unswerving trend of digital technology, and over recent years, the super mini UltraBook's popularity demonstrated that pursuing compactness is the key to digital products. Apacer knows that, in the flash drive industry, even a little thinner, one gram lighter or one second faster can remarkably enhance user experience. AH152 is simply the peak of pursuing the super-compactness & lightning speed philosophy. AH152's dazzling metallic design represents high-end style, perfectly matching the compact and stylish metallic style of the UltraBook. AH152 is compatible with Windows 7 system and to meet today's bulk data storage and transmission requirements, Apacer considerately provides free-of-charge ACE compression software. The software increases capacity by up to 500%. Thanks to its ultimate size, capacity, and speed, Apacer's AH152 sets an insurmountable benchmark for mini flash drives.